Fantastic kids butterfly print sleeping bag from Outwell. The Butterfly Girl sleeping bag use an Isofill® filling throughout for maximum warmth and comfort and are made using a 2-layer loose shell construction to minimize cold spots. The bag is idealfor sleepovers as well as everyday use while out camping and including a ridge hood, thermocollar insulation around the shoulder area for extra protection from the cold, full lengthzip baffle and anti-snag zip guard. The sleeping bag also features a big pocket on the front, a torch in the zipper puller and a new smart carrybag with extra room for those small sleepover secrets. We searched and searched for a sleeping bag that would be as beautiful as a child and as inviting as a stuffed animal. We finally found this one, in my eyes, the only one that met our criterium and still being a good camping bag. Unfortunately,we couldn't find a bigger size. We would have loved one for a 8 to 10 or 12 yer old. There's a good market for cheery sleeping bags for our children. Bought for 5yr old who loves it! Very cosy, super warm. Slept in regular pyjamas, no socks, no need for extra layers (end of summer so chilly at night). Good buy. 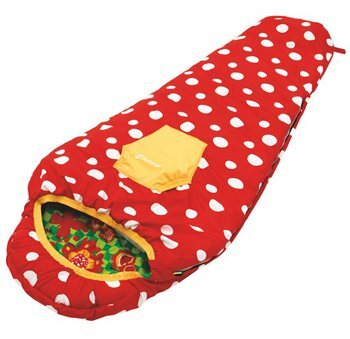 This sleeping bag is well worth the money, my daughter was really cosy and it is excellent quality. Good quality and very pretty - our daughter loves it!